In my childhood home, back in the 1970s, a meal of spaghetti Bolognese was considered exotic. This rare treat was due, in part, to post-war migration, and afforded the vast land of Australia some much needed diversity in culture! I schooled with many first generation Australians – myself included – whose families heralded from a variety of European countries. This first generation Australian was an ever ready participant to visit a friend’s home, to enjoy an afternoon snack (and embrace an array of new flavours along the way). Since those days as a child, the gastronomic palate of Australia has bulged well beyond the last belt hole. Cuisine from virtually every corner of the world is available. From every continent, from every country, it seems a global aroma permeates all the major cities. I suppose it is no surprise that the introduction of new tastes is common across all corners of the world. In the 18th century, a variation of the baba au rhum was introduced into France (by way of Alsace-Lorraine), from Poland. It is believed to be a descendent of the Kugelhopf. This dessert, traditionally shaped like a Champagne cork, is a rich, yeast bread, baked in a cylindrical mould. It is liberally (emphasis on liberally) soaked in a sweet rum syrup. The more modern version includes dried fruit, but this recipe, by Julia Child, omits the fruit and showcases the simplicity of the original dessert. The classic baba, as recommended by Julia, is finished simply with a few additional drops of rum, a brush of apricot preserve and a carefully topped glacéed cherry. I opted for the extra rum and apricot but not the cherry. Personal preference. There are variations of this dessert with cream or fruit. Each would serve as a lovely complement to the sweet rum laden bread. This would be an ideal dessert to finish off a rich, hearty meal. The rum syrup instantly cleanses the palate, and the hint of sweetness, from the rich bread and sugar syrup, provides a clear note to signal the end of the meal. Note: I baked the bread in a larger than recommended mould. Typically the cylindrical baba mould holds about 100ml of fluid, and is roughly 5cm or 2 inches in diameter and depth – much narrower and smaller than the mould I used. Melt the butter and let cool. Blend the yeast and water in the bowl with whisk and stand until yeast has dissolved completely. Beat in the sugar, salt and eggs. Mix the flour and the cool melted butter into the yeast with a wooden spoon. Knead the dough by lifting it, slapping it, and pulling it vigorously against the sides of the bowl for about 5 minutes. Alternatively, put into a mixer with a dough hook and mix until it starts to detach itself from the bowl. Form into a ball and cut a cross deep on top. Sprinkle with a little flour. Cove the bowl and let rise in a warm place for 1 ½ to 2 hours or until the dough has doubled in bulk. Butter the inside of your moulds. Lightly break off about a tablespoon of dough, enough to fill a third of a cup, and press lightly into the bottom of the cup. Place the cups, uncovered, again in a warm place and allow to rise 1 to 2 hours, or until the dough is over the rim of the cups. As soon as the dough has risen the second time, bake in the upper third of a preheated 180C/375F oven for about 15 minutes. Both the babas and the rum syrup should be lukewarm but not hot before this operation begins. If the babas are cold, warm slightly. Bring the water and sugar to a boil. Remove from the heat and stir until the sugar has dissolved. When the sugar syrup has cooled to lukewarm, stir in the rum. Arrange the babas in a dish, with their puffed tops up. Prick tops in several places, pour the syrup over them and let stand for ½ hour basting frequently. They should imbibe enough syrup so they are moist and spongy but still hold their shape. Drain on rack for ½ hour. After the babas have drained, sprinkle the top of each with a few drops of rum. Pain them with some apricot glaze/preserve, and place a cherry on top of each. During November, discover classic baking and desserts from regional France. 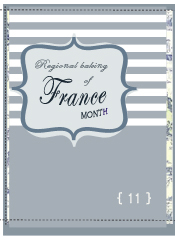 :: French month :: Read more here. This work is licensed under a Creative Commons Attribution-Noncommercial-Share Alike 3.0 Unported License. All words and photography by Julia @ Mélanger. Copyright © 2008-2009 unless otherwise indicated. All rights reserved.